Universal Pictures is getting back in the Vin Diesel business, and business is sounding awfully good. In summary, Diesel is returning to the two franchises that made him famous. We’ll likely see the next Fast and Furious first, as filming is set to begin later this year for a 2011 release. Even though I still haven’t forgiven Universal for not using my title — 4ever Fast, 4ever Furious — for last year’s fourth installment, I absolutely loved the movie. In fact, I’d go as far as saying it was one of the best movies of 2009 in terms of knowing exactly what it was, knowing exactly what it needed to be, and delivering on those promises with confidence and a whole lot of fun. Director Justin Lin and producer Neal Moritz are also back on board; Diesel will get a producing credit of his own, and I wouldn’t be surprised if returning co-star Paul Walker gets one, too. I absolutely love these movies, and I’m not ashamed to say that I can’t wait for the next one. The new Riddick, on the other hand, won’t be as easy a success. I remember rolling my eyes back in February 2000 when my Impact editor, John Mosby, asked me to review a low-budget sci-fi movie called Pitch Black. Five minutes into the movie, I was so close to the edge of my seat that I’m still surprised I didn’t fall off it. The film introduced me to the lovely Radha Mitchell, whom I sincerely thought was Juliana Hatfield for a few minutes, and also to Diesel, whose name made me wonder if he was a wrestler I’d never heard of. Diesel man-handled the film like a guy who steps off the bus a fully formed movie star, and director David Twohy (who took his own pass at the screenplay by Ken and Jim Wheat) never faltered in making sure that all the scares and thrills were driven by how much his audience cared about the characters and the connections and themes that defined them. Diesel wanted to turn his role as intergalactic anti-hero Richard B. Riddick into his very own “Conan in Space” kind of franchise, and he got his wish. Kind of. The sequel, 2004’s The Chronicles of Riddick, built such a huge new universe of mythology around Riddick that certain things seemed to get lost in the shuffle; concepts became more important than characters, and the movie suffered for it. I still love watching it — it looks absolutely amazing, the action is massive and intense, and Diesel certainly gives it everything he’s got and then some. But again, it’s the character issues that ultimately killed it, and nearly all of them involve the character of Jack. In Pitch Black, Jack (played by Australian actress Rhiana Griffith) was a young girl who disguised herself as a boy to suffer less harassment on the dangerous space-lanes. Riddick became her unlikely hero, and she idolized him so much that she shaved her head to look like him. Riddick, Jack, and holy man Imam (Keith David) were the only survivors of the film’s pterodactyl-like predators, and they seemed likely candidates for inclusion in the sequel. David returned as Imam, but only briefly. Griffith didn’t return at all … but Jack did. Here’s where things get confusing — Griffith joined Diesel and David in the recording studio to voice their characters for the Riddick animated short, Dark Fury. Griffith was 19 years old (and staggeringly beautiful) when the sequel came out, and even underwent physical training to reprise her role. But something happened on the way to the Underverse, because a reported squabble between Diesel and Universal resulted in Griffith being replaced by Alexa Davalos. Diesel fought for Griffith, while the studio wanted someone they considered prettier. Unfortunately, the film’s story was just as cruel to Jack as the studio was cruel to Griffith. Her age was seemingly rearranged to accommodate Davalos, and the character’s journey was just as cruel as her fate. Why change both actress and age when they were only going to kill her anyway? Davalos certainly doesn’t deserve any blame. She’s very tough in the film, and the documentaries on the Blu-Ray show an actress who’s deeply committed to the difficult physical challenges that come with such a role. But everything about how Jack was handled in the sequel came as a slap in the face not only to Jack and her original portrayer, but also to the fans who agreed that Jack was one of the coolest characters in Pitch Black and wanted something better for her in the sequel. Anyway, the story in Variety suggests that the next Riddick movie will be closer in size and scope to Pitch Black, which would also suggest that it will jettison much of the mythology introduced in The Chronicles of Riddick. That seems easier said than done, especially since the film’s finale turned Space Conan into King Conan, complete with a troubled brow. My solution? Write Rhiana Griffith a check, and bring Jack back. It’s easy. Just say that the Jack — who was calling herself “Kyra” anyway — in The Chronicles of Riddick was an impostor or something like that, planted in the prison to be used against Riddick. 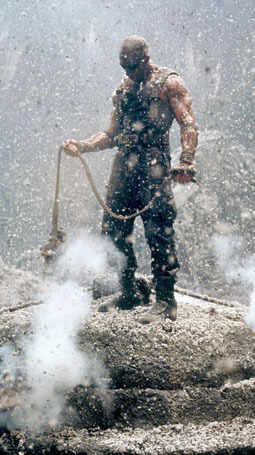 Begin the new movie with Riddick in a jam, and have Jack rescue him. That would immediately throw him off center and create opportunities for some really interesting story and character directions. They could even have fun with it. Maybe the real Jack sent Kyra to find Riddick. Riddick says, “I thought you were dead.” Jack replies, “Who, Kyra? How dense are you? She didn’t even look like me!” See how easy it is? I’m sure they’ll leave Jack dishonored and dead, but it would certainly be an interesting idea to explore. Either way, I hope they can at least create a new female character as strong as Mitchell’s Captain Carolyn Fry from Pitch Black. And that’s the Vin Diesel Report. More on these projects as they happen.